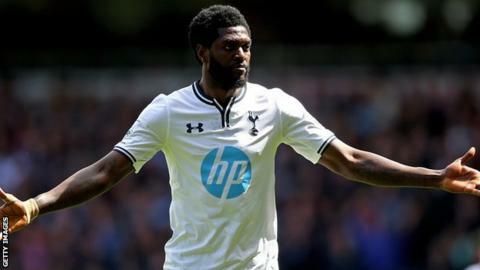 Striker Emmanuel Adebayor has been left out of Tottenham's Premier League and Europa League squads. The 31-year-old, who joined Spurs on a permanent deal in 2012 for £5m, has yet to feature for the club this season. Striker Saido Berahino, 22, was named in West Brom's squad, despite suggesting he will never play for the club again under chairman Jeremy Peace. Goalkeeper Victor Valdes was named in Manchester United's Premier League list but not in the Champions League squad. West Ham were keen to sign forward Adebayor during the transfer window, while Aston Villa wanted him on loan, but both were put off by his high wage demands. Tottenham had been trying to terminate his contract, but the Togo international wanted a £5m pay-off. That figure is understood to be the value of the final year of his contract. According to reports, Spurs had been willing to pay a portion of that amount, but the player is said to have refused the club's offer. The former Arsenal and Manchester City forward spent a successful 2011-12 season on loan at Spurs, scoring 17 goals. However, he has only managed 18 league goals in 47 league appearances for the club since signing a permanent deal. He made 17 appearances last season, having been granted two periods of compassionate leave. for personal reasons. Berahino was the subject of two failed bids on transfer deadline day from Spurs and tweeted that he was "sad" not to be able to say "exactly how the club has treated me" during transfer negotiations with Tottenham. He had been left out of West Brom's last two Premier League games and the Capital One Cup tie with Port Vale, with manager Tony Pulis saying he was not in the right frame of mind to play. Liverpool full-back Jose Enrique, 29, was named in the Reds' Premier League list, but was left out of the Europa League squad. Read more on Transfer window winners and losers, and what happens now?